This is my first article and I hope you will like it. After reading this article, you will have a good understanding about “Why we need UI design pattern for our application?” and “What are basic differences between different UI patterns (MVC, MVP, MVVP)?”. In traditional UI development – developer used to create a View using window or usercontrol or page and then write all logical code (Event handling, initialization and data model, etc.) in code behind and hence they were basically making code as a part of view definition class itself. This approach increased the size of my view class and created a very strong dependency between my UI and data binding logic and business operations. In this situation, no two developers can work simultaneously on the same view and also one developer’s changes might break the other code. So everything is in one place is always a bad idea for maintainability, extendibility and testability prospective. So if you look at the big picture, you can feel that all these problems exist because there is a very tight coupling between the following items. Definition of Glue code is different in each pattern. Although view and model is used with the same definition in all patterns. In case of MVC it is controller. In case of MVP it is presenter. In case of MVVM it is view model. In order to understand the entire article, I request readers to first understand the above entity. A fair idea about these will help you to understand this article. If you ever worked on UI module, you can easily relate these entities with your application. MVC (model view controller), MVP (model view presenter) and MVVM (model view view model) patterns allow us to develop applications with loss coupling and separation of concern which in turn improve testability, maintainability and extendibility with minimum effort. MVVM pattern is a one of the best solutions to handle such problems for WPF and Silverlight application. During this article, I will compare MVC, MVP and MVVM at the definition level. Before we dig into MVVM, let’s start with some history: There were already many popular design patterns available to make UI development easy and fast. For example, MVP (model view presenter) pattern is one of the very popular patterns among other design patterns available in the market. MVP is a variation of MVC pattern which is being used for so many decades. 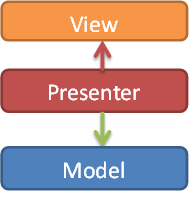 Simple definition of MVP is that it contains three components: Model, View and presenter. So view is nothing but a UI which displays on the screen for user, the data it displays is the model, and the Presenter hooks the two together (View and model). The view relies on a Presenter to populate it with model data, react to user input, and provide input validation. For example, if user clicks on save button, corresponding handling is not in code behind, it’s now in presenter. If you wanted to study it in detail, here is the MSDN link. In the MVC, the Controller is responsible for determining which View is displayed in response to any action including when the application loads. This differs from MVP where actions route through the View to the Presenter. In MVC, every action in the View basically calls to a Controller along with an action. In web application, each action is a call to a URL and for each such call there is a controller available in the application who respond to such call. Once that Controller has completed its processing, it will return the correct View. In case of MVP, view binds to the Model directly through data binding. In this case, it’s the Presenter’s job to pass off the Model to the View so that it can bind to it. The Presenter will also contain logic for gestures like pressing a button, navigation. It means while implementing this pattern, we have to write some code in code behind of view in order delegate (register) to the presenter. However, in case of MVC, a view does not directly bind to the Model. The view simply renders, and is completely stateless. In implementations of MVC, the View usually will not have any logic in the code behind. Since controller itself returns view while responding to URL action, there is no need to write any code in view code behind file. Step 1: Incoming request directed to Controller. Step 2: Controller processes request and forms a data Model. Step 3: Model is passed to View. Step 4: View transforms Model into appropriate output format. Step 5: Response is rendered. So now you have basic understanding of MVC and MVP. Let’s move to MVVM. 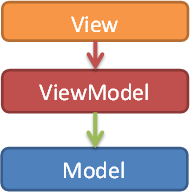 Model and View work just like MVC and “ViewModel” is the model of the View. ViewModel acts as an interface between model and View. 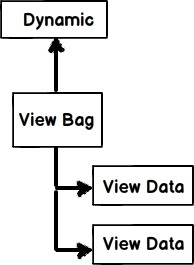 ViewModel provides data binding between View and model data. ViewModel handles all UI actions by using command. In MVVM, ViewModel does not need a reference to a view. The view binds its control value to properties on a ViewModel, which, in turn, exposes data contained in model objects. In simple words, TextBox text property is bound with name property in ViewModel. ViewModel reference is set to a DataContext of View in order to set view data binding (glue between view and ViewModel model). If property values in the ViewModel change, those new values automatically propagate to the view via data binding and via notification. When the user performs some action in the view for example clicking on save button, a command on the ViewModel executes to perform the requested action. In this process, it’s the ViewModel which modifies model data, View never modifies it. The view classes have no idea that the model classes exist, while the ViewModel and model are unaware of the view. In fact, the model doesn’t have any idea about ViewModel and view exists. 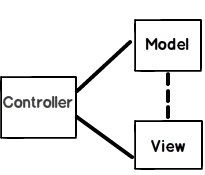 What is MVC(Model view controller)? Can you explain the complete flow of MVC? Is MVC suitable for both windows and web application? What are the benefits of using MVC? Is MVC different from a 3 layered architecture? What is the latest version of MVC? What is the difference between each version of MVC? What are routing in MVC? Where is the route mapping code written? Can we map multiple URL’s to the same action? How can we navigate from one view to other view using hyperlink? How can we restrict MVC actions to be invoked only by GET or POST? How can we maintain session in MVC? What is the difference between tempdata,viewdata and viewbag? What are partial views in MVC? How did you create partial view and consume the same? How can we do validations in MVC? Can we display all errors in one go? How can we enable data annotation validation on client side? Why razor when we already had ASPX? So which is a better fit Razor or ASPX? How can you do authentication and authorization in MVC? How to implement windows authentication for MVC? How do you implement forms authentication in MVC? How to implement Ajax in MVC? What kind of events can be tracked in AJAX? What is the difference between “ActionResult” and “ViewResult”? What are the different types of results in MVC? Can we create our custom view engine using MVC? How to send result back in JSON format in MVC? But WCF SOAP also does the same thing, so how does “WebAPI” differ? With WCF also you can implement REST,So why “WebAPI”? By reading these MVC interview question it does not mean you will go and clear MVC interviews. The whole purpose of this article is to quickly brush up your MVC knowledge before you for the MVC interviews. This article does not teach MVC, it’s a last minute revision sheet before going for MVC interviews. In case you want to learn MVC from scratch start by reading Learn MVC ( Model view controller) step by step 7 days or you can also start with my step by step MVC ( Model view controller) video series from youtube. 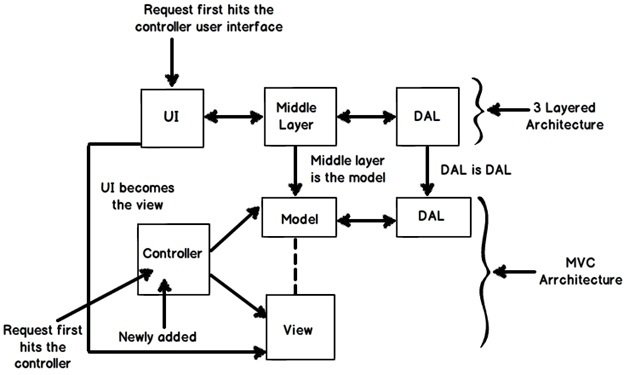 MVC is architectural pattern which separates the representation and the user interaction. It’s divided in three broader sections, “Model”, “View” and “Controller”. Below is how each one of them handles the task. The “View” is responsible for look and feel. “Model” represents the real world object and provides data to the “View”. The “Controller” is responsible to take the end user request and load the appropriate “Model” and “View”. All end user requests are first sent to the controller. The controller depending on the request decides which model to load. The controller loads the model and attaches the model with the appropriate view. The final view is then attached with the model data and sent as a response to the end user on the browser. MVC architecture is suited for web application than windows. For window application MVP i.e. “Model view presenter” is more applicable.IfyouareusingWPFandSLMVVMismoresuitableduetobindings. Separation of concerns is achieved as we are moving the code behind to a separate class file. By moving the binding code to a separate class file we can reuse the code to a great extent. Automated UI testing is possible because now the behind code (UI interaction code) has moved to a simple.NET class. This gives us opportunity to write unit tests and automate manual testing. MVC is an evolution of a 3 layered traditional architecture. Many components of 3 layered architecture are part of MVC. So below is how the mapping goes. Look and Feel User interface. View. Business logic /validations Middle layer Model. Request is first sent to User interface Controller. Accessing data Data access layer. Data access layer. When this note was written, four versions where released of MVC. MVC 1 , MVC 2, MVC 3 and MVC 4. So the latest is MVC 4. Below is a detail table of differences. But during interview it’s difficult to talk about all of them due to time limitation. So I have highlighted important differences which you can run through before the interviewer. Routing helps you to define a URL structure and map the URL with the controller. For instance let’s say we want that when any user types “http://localhost/View/ViewCustomer/”, it goes to the “Customer” Controller and invokes “DisplayCustomer” action. This is defined by adding an entry in to the “routes” collection using the “maproute” function. Below is the under lined code which shows how the URL structure and mapping with controller and action is defined. The route mapping code is written in the “global.asax” file. Yes , you can , you just need to make two entries with different key names and specify the same controller and action. By using “ActionLink” method as shown in the below code. The below code will create a simple URL which help to navigate to the “Home” controller and invoke the “GotoHome” action. We can decorate the MVC action by “HttpGet” or “HttpPost” attribute to restrict the type of HTTP calls. For instance you can see in the below code snippet the “DisplayCustomer” action can only be invoked by “HttpGet”. If we try to make Http post on “DisplayCustomer” it will throw an error. 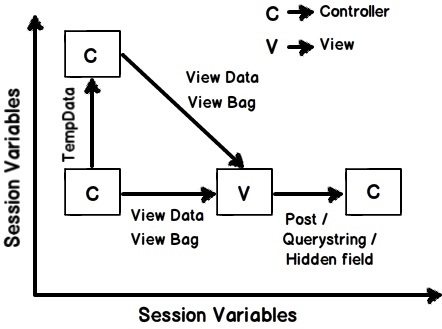 Sessions can be maintained in MVC by 3 ways tempdata ,viewdata and viewbag. What is the difference between tempdata ,viewdata and viewbag? Temp data: –Helps to maintain data when you move from one controller to other controller or from one action to other action. In other words when you redirect,“tempdata” helps to maintain data between those redirects. It internally uses session variables. View data: – Helps to maintain data when you move from controller to view. View Bag: – It’s a dynamic wrapper around view data. When you use “Viewbag” type casting is not required. It uses the dynamic keyword internally. Session variables: – By using session variables we can maintain data from any entity to any entity. Hidden fields and HTML controls: – Helps to maintain data from UI to controller only. So you can send data from HTML controls or hidden fields to the controller using POST or GET HTTP methods. Below is a summary table which shows different mechanism of persistence. Partial view is a reusable view (like a user control) which can be embedded inside other view. For example let’s say all your pages of your site have a standard structure with left menu, header and footer as shown in the image below. 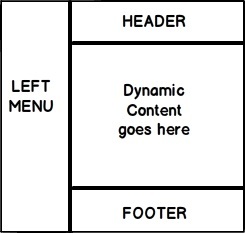 For every page you would like to reuse the left menu, header and footer controls. So you can go and create partial views for each of these items and then you call that partial view in the main view. 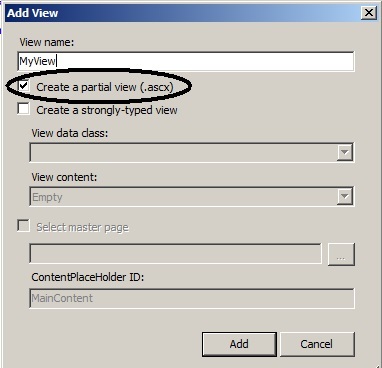 When you add a view to your project you need to check the “Create partial view” check box. Once the partial view is created you can then call the partial view in the main view using “Html.RenderPartial” method as shown in the below code snippet. One of the easy ways of doing validation in MVC is by using data annotations. Data annotations are nothing but attributes which you can be applied on the model properties. For example in the below code snippet we have a simple “customer” class with a property “customercode”. This”CustomerCode” property is tagged with a “Required” data annotation attribute. In other words if this model is not provided customer code it will not accept the same. In order to display the validation error message we need to use “ValidateMessageFor” method which belongs to the “Html” helper class. Later in the controller we can check if the model is proper or not by using “ModelState.IsValid” property and accordingly we can take actions. Below is a simple view of how the error message is displayed on the view. Yes we can, use “ValidationSummary” method from HTML helper class. What are the other data annotation attributes for validation in MVC? If you want to check string length, you can use “StringLength”. In case you want to use regular expression, you can use “RegularExpression” attribute. If you want to check whether the numbers are in range, you can use the “Range” attribute. Some time you would like to compare value of one field with other field, we can use the “Compare” attribute. In case you want to get a particular error message , you can use the “Errors” collection. If you have created the model object yourself you can explicitly call “TryUpdateModel” in your controller to check if the object is valid or not. In case you want add errors in the controller you can use “AddModelError” function. It’s a two-step process first reference the necessary jquery files. Second step is to call “EnableClientValidation” method. It’s a light weight view engine. Till MVC we had only one view type i.e.ASPX, Razor was introduced in MVC 3. Razor is clean, lightweight and syntaxes are easy as compared to ASPX. For example in ASPX to display simple time we need to write. In Razor it’s just one line of code. As per Microsoft razor is more preferred because it’s light weight and has simple syntaxes. You can use windows or forms authentication for MVC. For windows authentication you need to go and modify the “web.config” file and set authentication mode to windows. Then in the controller or on the action you can use the “Authorize” attribute which specifies which users have access to these controllers and actions. Below is the code snippet for the same. Now only the users specified in the controller and action can access the same. Forms authentication is implemented the same way as we do in ASP.NET. So the first step is to set authentication mode equal to forms. The “loginUrl” points to a controller here rather than page. We also need to create a controller where we will check the user is proper or not. If the user is proper we will set the cookie value. All the other actions need to be attributed with “Authorize” attribute so that any unauthorized user if he makes a call to these controllers it will redirect to the controller ( in this case the controller is “Login”) which will do authentication. Below is a simple sample of how to implement Ajax by using “Ajax” helper library. In the below code you can see we have a simple form which is created by using “Ajax.BeginForm” syntax. 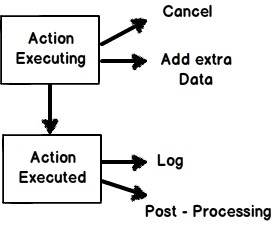 This form calls a controller action called as “getCustomer”. So now the submit action click will be an asynchronous ajax call. In case you want to make ajax calls on hyperlink clicks you can use “Ajax.ActionLink” function as shown in the below code. So if you want to create Ajax asynchronous hyperlink by name “GetDate” which calls the “GetDate” function on the controller , below is the code for the same. Once the controller responds this data is displayed in the HTML DIV tag by name “DateDiv”. Below is the controller code. You can see how “GetDate” function has a pause of 10 seconds. The second way of making Ajax call in MVC is by using Jquery. In the below code you can see we are making an ajax POST call to a URL “/MyAjax/getCustomer”. This is done by using “$.post”. All this logic is put in to a function called as “GetData” and you can make a call to the “GetData” function on a button or a hyper link click event as you want. “ActionResult” is an abstract class while “ViewResult” derives from “ActionResult” class. “ActionResult” has several derived classes like “ViewResult” ,”JsonResult” , “FileStreamResult” and so on. “ActionResult” can be used to exploit polymorphism and dynamism. So if you are returning different types of view dynamically “ActionResult” is the best thing. For example in the below code snippet you can see we have a simple action called as “DynamicView”. Depending on the flag (“IsHtmlView”) it will either return “ViewResult” or “JsonResult”. Note: -It’s difficult to remember all the 12 types. But some important ones you can remember for the interview are “ActionResult”, “ViewResult” and “JsonResult”. Below is a detailed list for your interest. “ActionFilters” helps you to perform logic while MVC action is executing or after a MVC action has executed. Provide extra data to the action. To create a inline action attribute we need to implement “IActionFilter” interface.The “IActionFilter” interface has two methods “OnActionExecuted” and “OnActionExecuting”. We can implement pre-processing logic or cancellation logic in these methods. 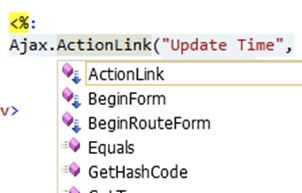 The problem with inline action attribute is that it cannot be reused across controllers. So we can convert the inline action filter to an action filter attribute. To create an action filter attribute we need to inherit from “ActionFilterAttribute” and implement “IActionFilter” interface as shown in the below code. Later we can decorate the controllers on which we want the action attribute to execute. You can see in the below code I have decorated the “Default1Controller” with “MyActionAttribute” class which was created in the previous code. Let’ say we want to create a custom view engine where in the user can type a command like “<DateTime>” and it should display the current date and time. Step 1:- We need to create a class which implements “IView” interface. In this class we should write the logic of how the view will be rendered in the “render” function. Below is a simple code snippet for the same. Step 2 :-We need to create a class which inherits from “VirtualPathProviderViewEngine” and in this class we need to provide the folder path and the extension of the view name. For instance for razor the extension is “cshtml” , for aspx the view extension is “.aspx” , so in the same way for our custom view we need to provide an extension. Below is how the code looks like. You can see the “ViewLocationFormats” is set to the “Views” folder and the extension is “.myview”. Step 3:- We need to register the view in the custom view collection. The best place to register the custom view engine in the “ViewEngines” collection is the “global.asax” file. Below is the code snippet for the same. <span class="Apple-tab-span" style="white-space: pre; ">	</span>…..
Below is a simple output of the custom view written using the commands defined at the top. If you invoke this view you should see the following output. In MVC we have “JsonResult” class by which we can return back data in JSON format. Below is a simple sample code which returns back “Customer” object in JSON format using “JsonResult”. Below is the JSON output of the above code if you invoke the action via the browser. For satisfying the broad range of client “REST” was the proposed approach. You can read more about “REST” from WCF chapter. “WebAPI” is the technology by which you can expose data over HTTP following REST principles. Size Heavy weight because of complicated WSDL structure. Light weight, only the necessary information is transferred. Formats To parse SOAP message, the client needs to understand WSDL format. Writing custom code for parsing WSDL is a heavy duty task. If your client is smart enough to create proxy objects like how we have in .NET (add reference) then SOAP is easier to consume and call. 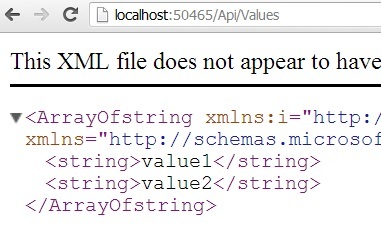 Output of “WebAPI” are simple string message,JSON,Simple XML format etc. So writing parsing logic for the same in very easy. Principles SOAP follows WS-* specification. WEB API follows REST principles. (Please refer about REST in WCF chapter). WCF was brought in to implement SOA, never the intention was to implement REST.”WebAPI'” is built from scratch and the only goal is to create HTTP services using REST. Due to the one point focus for creating “REST” service “WebAPI” is more preferred. How to implement “WebAPI” in MVC? 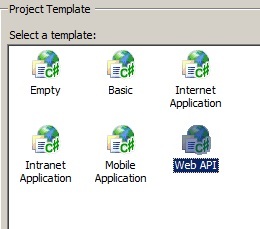 Step1:-Create the project using the “WebAPI” template. Step 2:- Once you have created the project you will notice that the controller now inherits from “ApiController” and you can now implement “post”,”get”,”put” and “delete” methods of HTTP protocol. Step 3:-If you make a HTTP GET call you should get the below results.